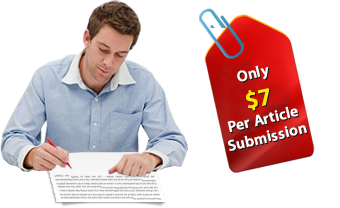 You Provide The Articles, Our Article Submission Experts Submit Them For Maximum Exposure! This service is setup for those who have their own articles they want our article submission team to submit on their behalf. Many of our customers prefer to write their own articles so they can be the voice of their business. Our writers are professionals who are great at writing high quality articles - you can have us WRITE and SUBMIT articles for your website by choosing our 'Article Writing + Signature Submission Packages' but if you are an expert in your area and prefer to write the articles yourself and have our article submission experts submit the articles for you then please read below and submit your order. Article(s) must be at least 500 words for us to gain MAXIMUM approval from the places we submit to. The cost is the same per submission no matter how long the word count is. Article(s) cannot have been published. We cannot submit to many of the top directories including Ezinearticles.com if the article is posted on your site or has been submitted before. Re-submitting the same article is a direct violation of their rules and can get our/your article submission accounts banned. No spinned, reused, or bad articles. Each article must be well written and provide useful information otherwise they will be rejected. We can submit your articles using YOUR article submission accounts or ours. We already have established accounts with all the major article directories and submission services and we can submit your articles and resource box information using our accounts. The downside is you will not be able to view the article stats such as views, clicks, etc. It is advised if you want to keep track of all the stats of your articles you sign up accounts at the places we submit to and provide the logins / passwords to our submission team. You can see the full list of where we submit to at the bottom of this order form. *Note: Click the + symbol to the right to attach up to 10 articles individually. We can accept articles in Microsoft Word format, PDF format, Wordpad, Notepaid, etc. after submitting this form and making payment. If you choose to allow us to use your iSnare account please keep in mind that in order to use their mass submission service we will need you to add distribution credits to your account. If you choose to let us submit using your articles using our iSnare account we will take care of the fee, but if you decide to use your account we kindly ask that you make sure there are distribution credits already applied to your account. We have an exclusive agreement with DistributeYourArticles.com to provide the best quality article submissions for our clients. We are only allowed to use 1 pen name under our agreement. If you would like to create your own paid DistributeYourArticles.com account and pen name please do so at www.DistributeYourArticles.com and then enter your username and password into this form so we can access your account and fulfill the article submissions. Otherwise, leave the username and password field blank and we will use our account and generic pen name to submit your articles with your resource box/website URL"
If you have already written one or more resource boxes that you want us to use to submit your articles please input it into this area. You can use HTML or plain text but please be sure that it is formatted correctly. Please keep in mind that many article directories will only allow for two links to be used inside the resource box. If you do not input a resource box in this area we will create one for you. If you would like us to create your resource box then we kindly ask for you to provide as much information as possible about your niche and offers. Through testing we've come to the conclusion that the resource boxes with the click-through rates are those that advertise offers such as free e-courses, free reports, tips, etc.. Please give us any unique selling point we can use to give you the best results! Also please include the SEO keywords you are targeting for your site so we can anchor text link these in the resource box to help your site get backlinks for SEO from the article directories. I attest my articles have never been used or published anywhere on the internet before, including my own website. I also attest these are originally written articles - not spinned, reused, or copied articles. I understand that if my articles have been used before they will not be published.